Learn about the best Yosemite National Park lodging for your vacation in Yosemite, California. Yosemite is one of the most beautiful places on earth. Most visitors want to spend a weekend or an entire week in Yosemite, so finding the right Yosemite lodging is important. For camping options, see Yosemite camping. Yosemite Valley lodging is the best location for most visitors, and ranges from 5 star hotels to camping. Another good choice for lodging near Yosemite is in Yosemite West, just 12 miles from Yosemite Valley. 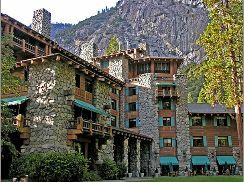 Ahwahnee hotel Yosemite is the premier five star hotel in Yosemite Valley, suitable for special occasions and travelers with lots of money. Make your Ahwanhee hotel reservations early, as they sell out during the summer and weekends months in advance. They offer fine dining in their Ahwahnee dining room, and advance reservations are recommended. The Ahwahnee Yosemite is open all year around. For Ahwahnee reservations call phone number 801-559-4884. 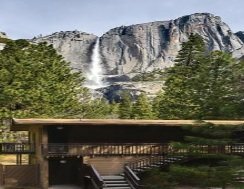 Yosemite lodge at the falls is a medium priced lodge, located near the base of Yosemite Falls in the heart of Yosemite Valley. There are several restaurants located at Yosemite Lodge, including the Food Court (open for breakfast, lunch and dinner), the Mountain Room (open for dinner only), and the Mountain Room Lounge for casual dinner and drinks. The Yosemite Valley tours all leave from the lodge. The lodge also has a swimming pool, bicycle rentals, and is a short 10 minute walk to lower Yosemite Falls. For Yosemite lodge reservations call phone number 801-559-4884. 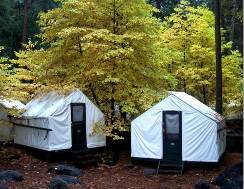 Yosemite tent cabins in Half Dome Village are an inexpensive option for Yosemite Valley lodging. Located in the heart of Yosemite Valley near Yosemite Village, Half Dome Village (formerly called Curry Village) offers tent cabins (some heated, some unheated), cabins and hotel rooms. For Yosemite Curry Village reservations call phone number 801-559-4884.
is located at the south entrance of Yosemite, near the highway 41 entrance. The European style hotel offers rooms with and without private bathroom. This historic hotel is located near a 9 hole golf course, a Pioneer Yosemite history center, and Mariposa Grove redwoods. 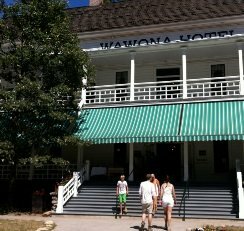 For Wawona Hotel Yosemite National Park lodging reservations call phone number 801-559-4884. 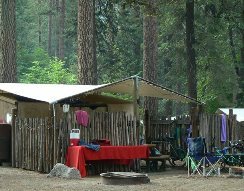 Housekeeping Camp Yosemite Valley lodging offers a camping experience without setting up camp. Your site has a concrete floor, 3 concrete walls, double bed and bunk beds, and a picnic table. Bring your own linens and food and do your own housekeeping. 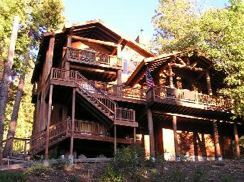 For Housekeeping Cabins in Yosemite National Park lodging reservations call phone number 801-559-4884. Yosemite West is the best alternative to lodging in Yosemite Valley. It is located only 15 minutes from Yosemite Valley, off Highway 41, near the exit for Glacier Point and Badger Pass ski area. Yosemite West has a Bed and Breakfast Yosemite (rated one of the top places to stay in Yosemite by Trip Advisor), vacation homes for rent, and condominiums. For reservations call Yosemite West at 209-372-4567 or 559-642-2211. Yosemite campgrounds include several campgrounds in Yosemite Valley, Bridalveil creek campgrounds on Glacier Point Road, Tamarack Flat and Crane Flat on highway 120 entrance to Yosemite, and Wawona Campground near the south entrance. There are additional campgrounds further out, including Hodgdon Meadow, Tamarack, Yosemite Creek campground, White Wolf, and Porcupine Flat. For Yosemite campground reservations and information see Yosemite National Park Camping. Note that some campgrounds are available on a first come, first served basis, and others may be closed due to seasonal road closures or heavy snow pack. Tuolumne Meadows and High Sierra camps are open during the season weather permitting (tentative May - early September). These Yosemite National Park lodging sites are seasonal and are some are popular with those hiking and backpacking in Yosemite wilderness backcountry. Lodging outside Yosemite is available along the 3 western entrances to Yosemite: highway 41 to the south, highway 140 to the west, and highway 120 to the northwest. Because these hotels near Yosemite are 45 minutes or more from the Yosemite valley attractions, it is recommended that you stay inside Yosemite park, either at one of the Yosemite Valley lodgings, or at Yosemite West. Autocamp, a new Airstream hotel, will open in February 2019 near the town of Mariposa. It offers Airstream campers, fun safari-style tents, and cabins in an upscale camping environment. For more information see autocamp.com. Check out these Yosemite maps to help you plan your vacation.